This painting has long been on the mind of the artist. Before he began he knew the trees would need to be somewhat bare otherwise the distant buildings would not be so visible. He also knew it would have to be a rainy afternoon, perhaps with a bit of clearing in the skies and a bit of late afternoon sunshine striking some of the buildings. Saint Paul, Minnesota has been called the last of America's eastern cities. While this is true Saint Paul also conveys the essence of a European city as well. This being a compliment well deserved because of its architecture, beautiful parks and magnificent river valley setting. St. Peter Street is in the heart of this capital city. It features great dining and great views. 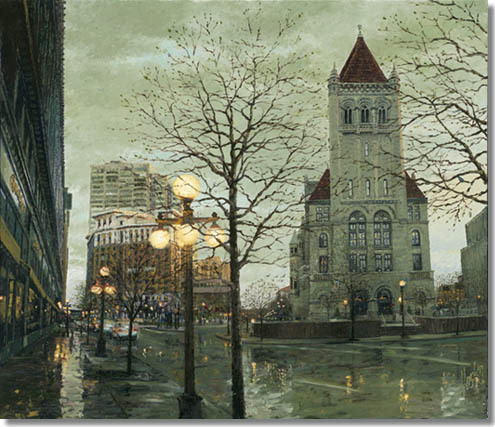 In this painting the viewer is standing in front of the renowned Hamm Building looking south towards the Mississippi River valley. 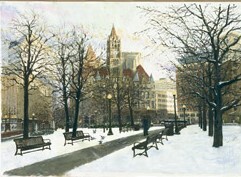 Rising on the right as though a cathedral, is Landmark Center - 1901. Beyond is the Saint Paul Hotel - 1910 and Landmark Tower condominiums - 1981.